The day started out with a hard climb, maybe as a forewarning of things to come.The views of the gulf were spectacular however. 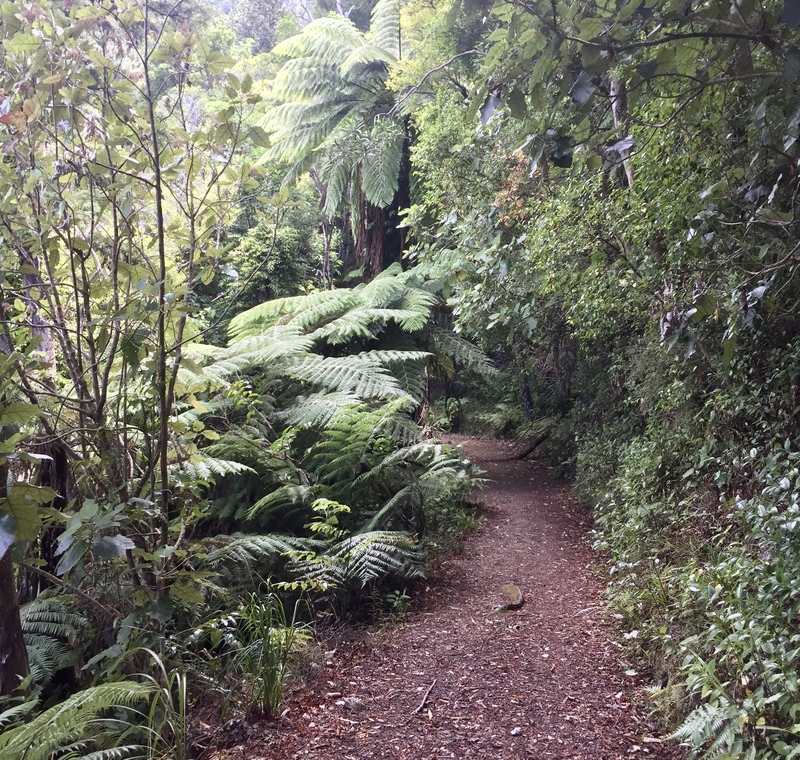 After a few miles of climbing it was downhill to Port Jackson. There was a fancier campground there, but little else. As the road was nearing it's end there was virtually no traffic. One more climb before droping down to Fletcher Bay. Some folks stopped to talk at the top of the hill nd took a picture of me. At Fletcher Bay was another nice Department of Conservation campground. These are quite large compared to US campgrounds and quite sprawling. I found the office and enquired about the trail. I was relieved to find it was 5 Km long not 10 Km as I first thought. 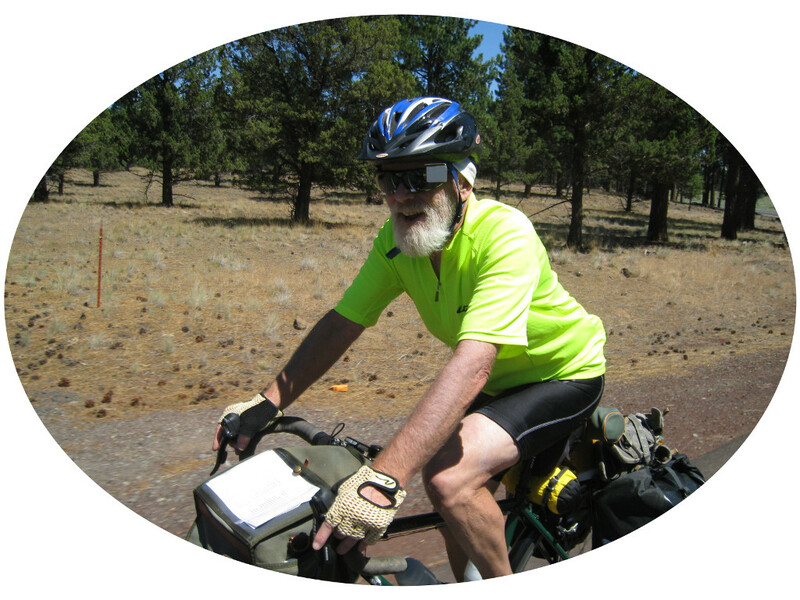 As I got to the trailhead I ran into the same people who had taken my picture a bit earlier. At the trail enterance was a step ladder they helped me struggle my bike up and over. 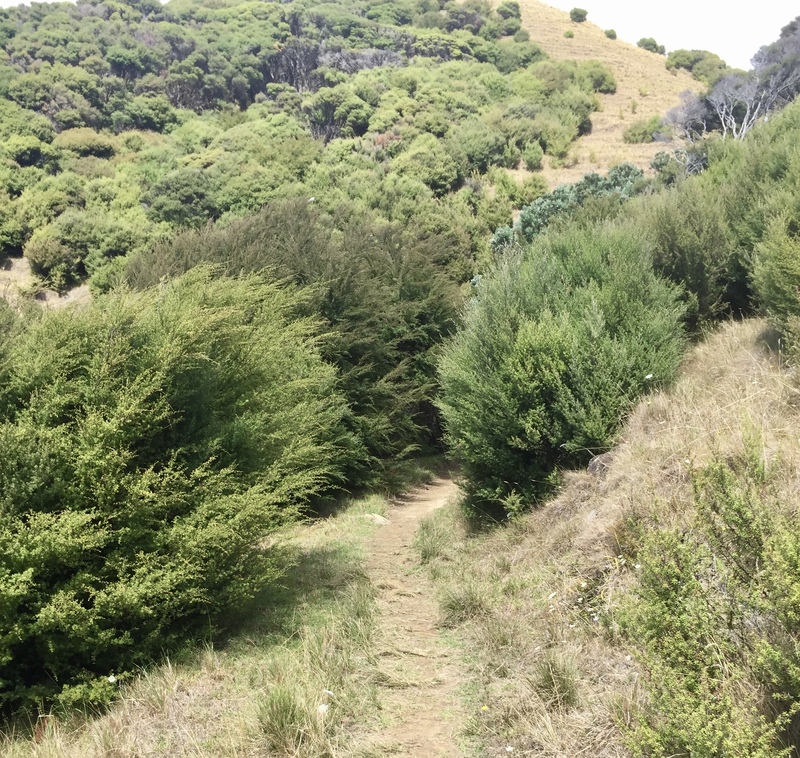 From there the very narrow trail went straight up over bumpy sod, completely unridable. Undeterred I pushed. The folks at the bottom were watching and I waved when I stopped for my first breater, amazed at how high up I was already. Then the trail entered a cow pasture and was barely discernable in places. I had to dodge the cow pies. I tried riding a little, but mostly walked. I ran into some hikers coming the other way which assured me I was not lost. 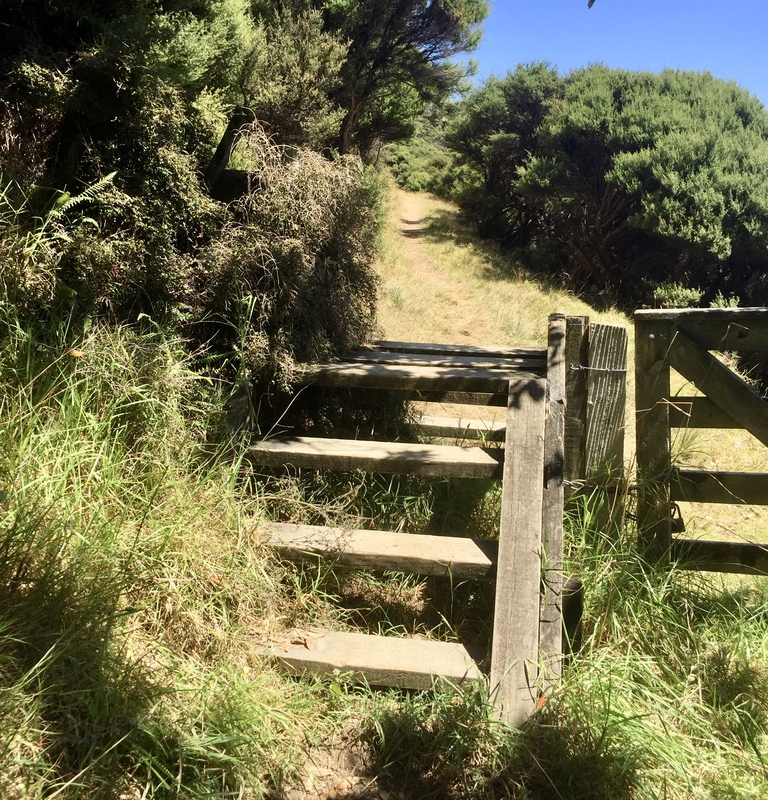 Eventually it was up and over another step ladder, still steady uphill, some ridable, most not. The hills here looked mostly like California or Oregon in summer. Every now and then I'd come around a bend and get a view of the coast behind me. After what must have been a couple of hours of mostly pushing the trail started downhill. At first I could ride but soon it became very steep with ruts, rocks, and roots. This would have been challenging even on a full suspension mountain bike. All I could do was hold on to the brakes and fast walk along side the bike. I meet some hikers at this point who were seriously struggling just to walk up the trail. At the bottom was Poley bay. I rested for a bit before even thinking about what was next. The climb out of Poley Bay was one of the hardest things I have ever done in my life. It was litteraly push the bike a couple of feet, clamp the brakes, step up and rest until I caught my breath. 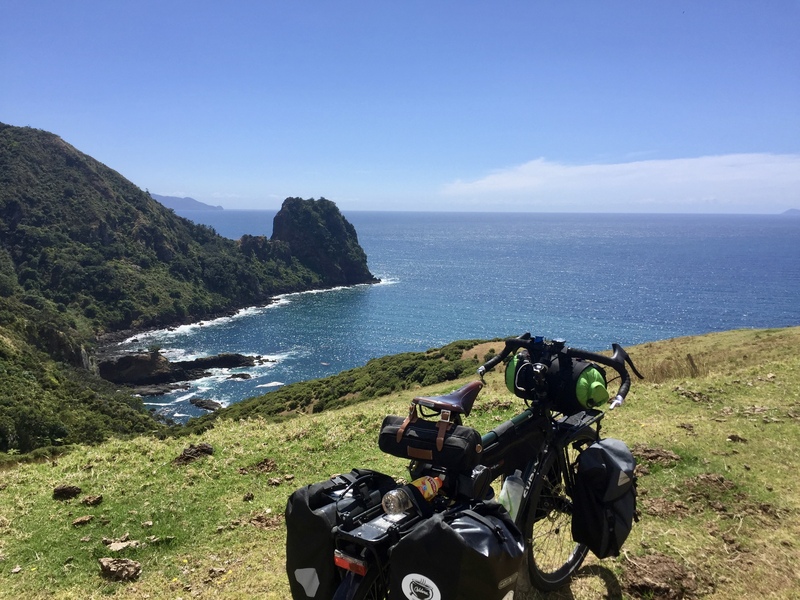 At one point I had to take the panniers off, push the bike up, and come back for the panniers. It went on like this for the entire 580 feet from seal level to the highest point. That doesn't sound like a lot of vertical, but when you do it in less than about 300 meters , over very rough terrain, it is brutal. By the time it started letting up I was pretty well done for. If I had come to a decent place to camp I may have stopped right then and there, but there was nothing flat. Everything was vertical and the bush was getting thicker and thicker. About then the trail came out it the open right on the edge of the bluff. It was starting to look ridable were it not for the 500 foot dropoff on one side. There was a nice bench to sit and enjoy the view, which I did for a while. Just beyond that the trail turned away from the bluff and looked very ridable. I started riding thinking it would only last a few hundred feet and I'd have to get off again, but instead it kept getting better and I was treated to some of the best single track of my life for at least 2 Km on down to Stoney Bay. The trail swooped around all of the little gorges with creek crossings, most of which I could ride though but a few were rocky enough that I got off. I could almost forget the pain I had just experienced with the joy of riding this beautiful trail through the lush jungle. Too soon I was down and riding into the campground at Stoney Bay. The first person I encountered at the campground was Tom, originally from Portland but a Kiwi for the past 21 years. He knew of Mark whom he considered a legend due to his work protesting and shutting down mining in the 1980's. 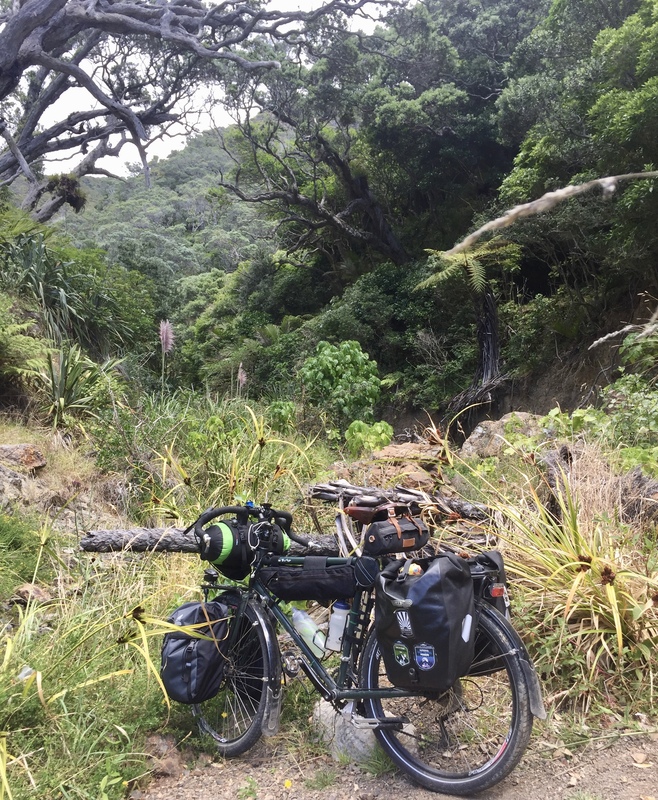 I talked to Tom for a while and then setup camp in a lovely spot behind a huge Pōhutukawa tree overlooking the bay. Very nice. 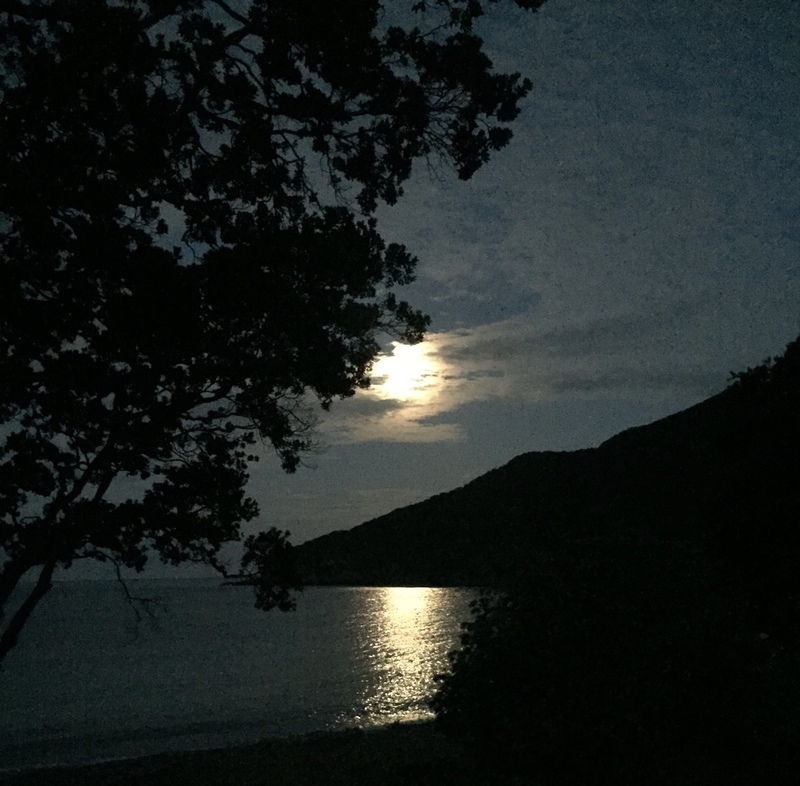 Later that evening I was treated to a spectacular moonrise over the bay. 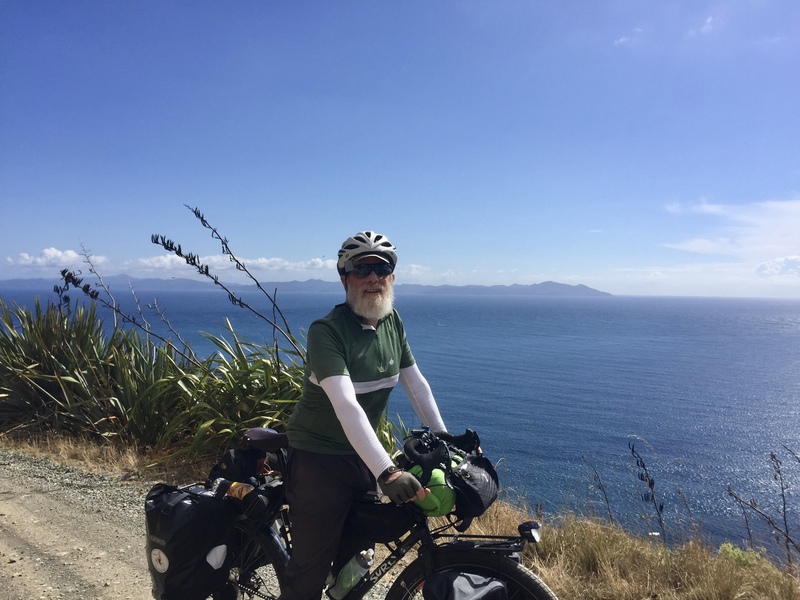 More great gravel riding along Hauraki Gulf. 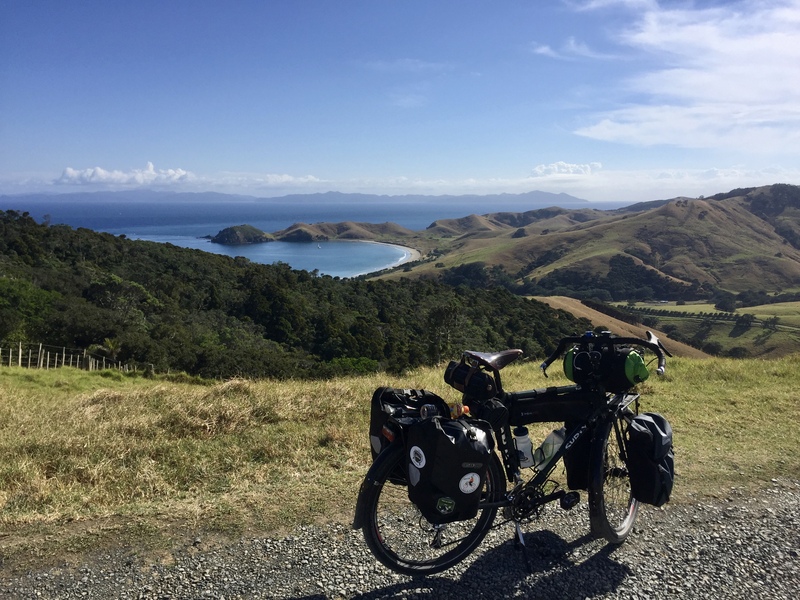 On top of another hard climb, overlooking Hauraki Gulf. Some nice tourists stoped to chat and take a picture of me. 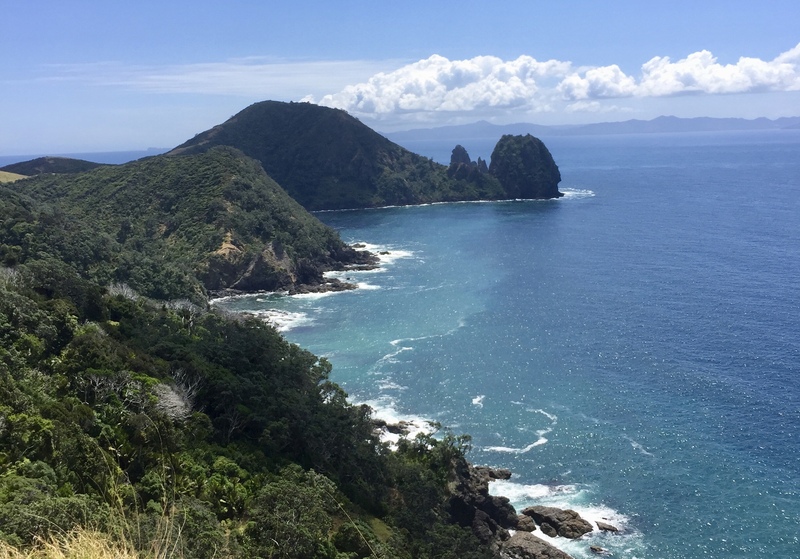 There is nothing flat on Coromandel. 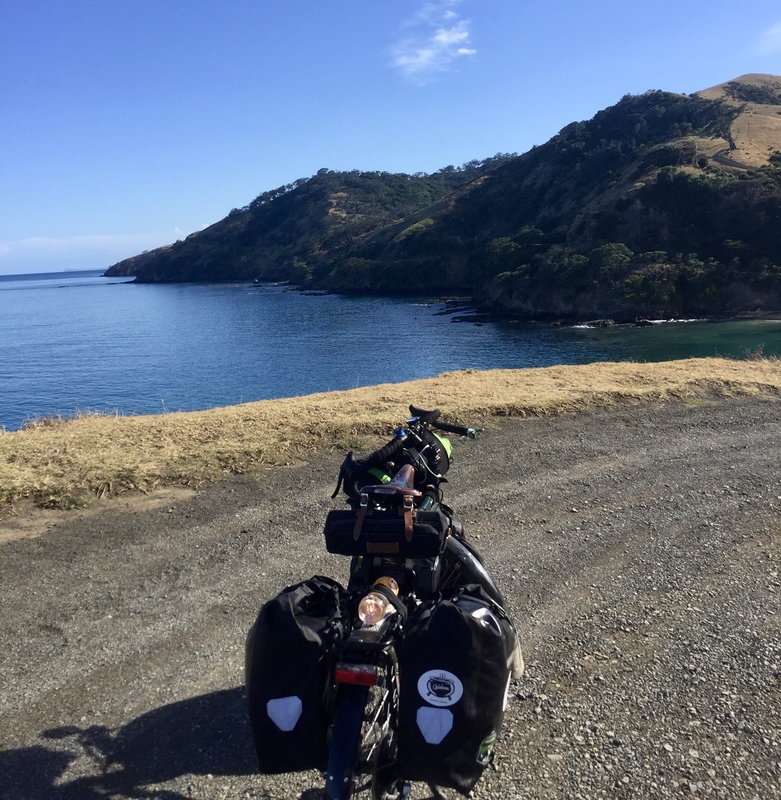 Hard riding but spectacular views. The scale at the bottom is 1-10, but the distance was actually 5 Km. The highest point was 177 meters which is about 580 feet. One of the rare ridable sections of the trail. I had to haul my heavily loaded touring bike over several of these step ladders. Back down to sea level at Poley Bay. Very steep coming down, very steep going up. From sea level at Poley Bay it was a hard push up the trail to about 580'. Finally got some wonderful single track for about 2 Km down to Stoney Bay. 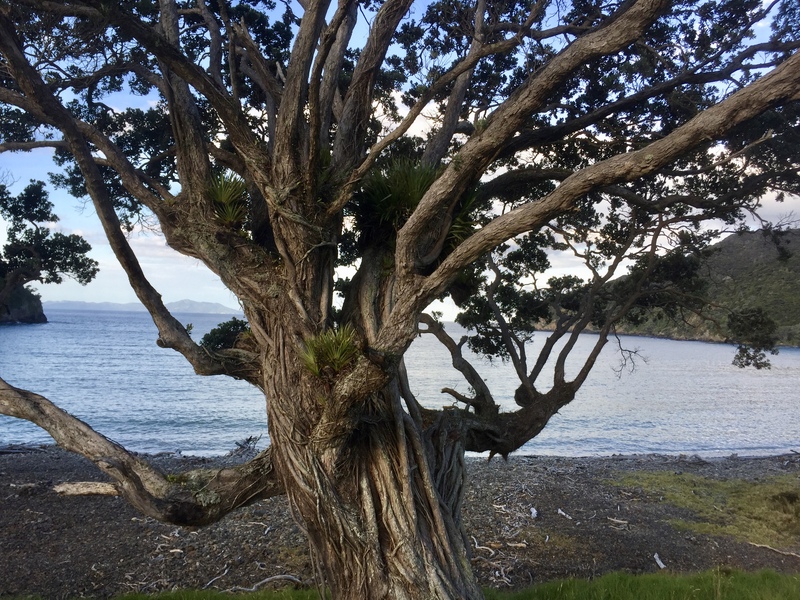 One of many Pōhutukawa trees that lined the bays. These are also known as New Zealand Christmas trees as they bloom with bright red flowers at Christmas time.